Hello people and welcome back to Tokyo DisneySea, the world's best, most immersive theme park. Last week, I published a review on this theme park so if you happen to miss it, check it out here. As you might have expected, Tokyo DisneySea is a large park with plenty of things to see and explore. If you compare it to the park next door, Tokyo Disneyland, you'll notice straightaway that it's considerably bigger that a normal Disney park: 71 hectares compared to 46 hectares. That's almost 50% bigger thanks to the vast body of water that separates the park's attractions further from each other. On a crowded day like this, prior planning will help you make the most of your Tokyo DisneySea visit. Tips #8: Secure your spot early for Fantasmic! Any theme park enthusiasts would know that the golden rule to beat the crowd is to arrive early in advance of the park's opening time. For my visit, I arrived at the park around 100 minutes before the park's opening time (8:00am). I thought I was super early. The crowd at Tokyo DisneySea's entrance 2 hours before opening time (8:00am). You know Japanese for their discipline. You know Japanese for their punctuality. You know Japanese for their commitment and dedication to work. What you don't know, however, is their dedication to arriving super early for their theme park visits. Even as I arrived at the park 2 hours before opening time, I was already too late. By then, there were already around 200+ people lined up in an orderly manner waiting for the ticket gates to open. So first tip of the day will be to arrive early. Seriously. If you arrive at the park more than 30 minutes after the park opens - well - be prepared to wait longer than expected. Getting yourself familiarised with the park layout is important in order for you to plan your route for the day - or at least for the first few FastPasses and rides that you want to get. You can do this while you're sitting down and waiting for the park gate to open. It won't take that long, really. 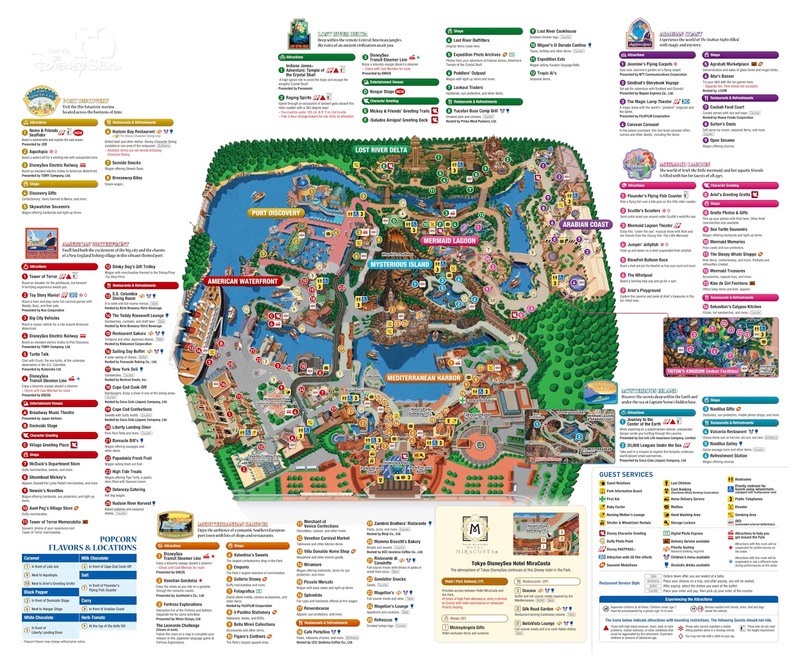 Grab a park map and familiarise yourself with the general layout. Try to get yourself familiarised with the routes that you're planning to take in the first 60 minutes of your visit, which are crucial in order to get the much coveted FastPass tickets and one of the first spots in the queues for the most popular rides in the park. If you've been to a Disney theme park before, you'd know that obtaining FastPass tickets for the most popular rides is a must especially for a visit on a crowded day. Tokyo DisneySea is no exception. In fact, Tokyo DisneySea is - unfortunately - an extreme case in which you really have to optimise your strategy. In Japan, every single visitor knows about FastPass, how to utilise the system, and the route that they need to take. Optimising your FastPass strategy is crucial to minimise your queue time at Tokyo DisneySea. Nemo & Friends SeaRider is a brand new ride, so expect long lines for both FastPass and standby queues. The time between the moment you obtain your previous FastPass ticket and the return time of your previous FastPass ticket. If your previous FastPass ticket return time for a particular attraction is after you're allowed to obtain your next FastPass ticket, you're unable to obtain another FastPass ticket for that same attraction. Don't get left behind! FastPass tickets for Nemo & Friends SeaRider run out quickly. Here you see the return time at around 9:25am. As soon as you enter the park, I highly recommend you to obtain a FastPass ticket for Toy Story Mania. FastPass tickets for this attraction runs out incredibly fast. If you arrive at the park 30 minutes after the park's opening hour, you'll probably get your return time closer to the park's closing time, which would be unfavourable. So there you have your FastPass strategy. Hopefully, you have a wonderful time collecting FastPass tickets at the park. This section is only for those who don't mind getting their parties separated when riding rides. If you do mind, feel free to skip this section. Indiana Jones Adventure: Temple of the Crystal Skull is one of the two attractions at the park that utilises Single Riders lanes. This is the reason why you shouldn't prioritise these attractions in your FastPass strategy. By using Single Rider lanes in these attractions, you can cut your queue time significantly. For example, I waited for only 10-15 minutes using Single Rider lanes when the normal standby queue time was 85 minutes. Single Rider queue time for Raging Spirits usually hovers around 10-20% of the normal standby queue time. There's a catch, though. Single Rider lanes are designated for - you guessed it - single riders. Anyone who uses this line will be treated as a lone, single guest and will be used to fill possible empty seats on the ride. Thus, all parties - no matter how small - will be separated. If you don't mind getting separated, however, Single Rider lanes can be a huge time saver for your party. Tokyo Disney Resort in its entirety is known for being different compared to its sister resorts anywhere else around the world. The first thing that you'll identify right away is how quirky this place is. From the visitors to the Cast Members themselves, they seem to carry more pride with their own quirkiness in this resort. But you know what's even more quirky? The popcorn. At both Tokyo Disneyland and Tokyo DisneySea, popcorns are real business and major highlights that you shouldn't skip during your visit. 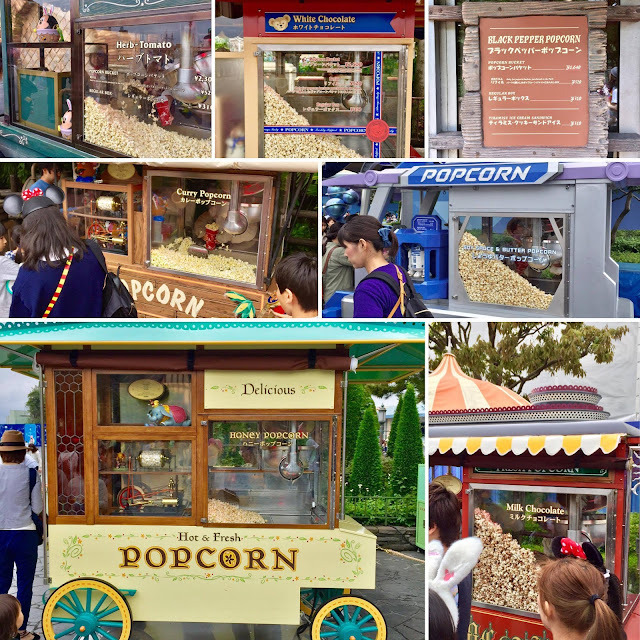 Tokyo Disneyland and Tokyo DisneySea are well-known for their quirky popcorns. If during your visit to Tokyo DisneySea you encounter a popcorn cart, check right away the flavour that they're serving. My surprise favourite is the Herb-Tomato flavour, which I was really skeptical of at first. But I can't resist the amazing scent - it smells like that tomato they use on Italian pizza. The taste turns out to be nothing but incredible. Even better, each small bucket of popcorn is only JPY 310. That's roughly $3 or £2.25! Such amazing value! If you happen to be walking around American Waterfront area at noon and you see people lining up for something for no reason, then this is something that you should take notice and pay attention. Most likely, these people are lining up for - what I said as - the best live stage show ever created by Disney, Big Band Beat. Big Band Beat is the most popular show at Tokyo DisneySea. Big Band Beat is a Broadway-scale musical revue show that takes guests on the musical journey of Roaring '20s era in New York City. The performers are top-notch and the execution is so smooth that you won't expect yourself to be watching this show in Tokyo. The theatre itself is beautiful and charming, allowing you to enjoy the true aesthetic of the show - especially if you sit in the middle orchestra section. Big Band Beat is, without doubt, the most popular show at the theme park. It's so popular that you have to win the lottery in order to get the chance to watch it. It does make sense though: with only 5-6 shows every day, they can only accommodate 6,000-7,500 guests every day. That's a tiny fraction of average number of daily guests at the park (~40,000 guests). While Big Band Beat takes place in the theatre marked by the "star" mark, the lottery for the show can be obtained at Biglitteria, marked "square" on the map above. To enter the lottery, you have to go to this place called Biglitteria located right before you enter the American Waterfront area (refer to the map below). Scan all tickets in your party and pick the showtime that you wish to enter the lottery for. After that, all you can do is cross your fingers and toes and wish for the best. Line up in advance of the latter shows (a limited amount of seats are provided for standby guests). Fortress Explorations is a beautifully designed adult playground with exhibits like illusion room and planetarium. Hidden in a tucked corner of Mediterranean Harbor, you'll also find a section dedicated to the famous canal city of Venice, Italy. It's in here you'll find arguably the most charming and memorable attraction in the park (if you're a travel addict), Venetian Gondola. The Venetian Canal mini-land is tucked in a hidden corner of Mediterranean Harbor. ... or how about taking a stroll in the small streets of Italy? Does this remind you of Ponte Vecchio of Florence, Italy? In American Waterfront, you can even get on board of a full-scale cruise ship a la Titanic era. On board the ship, you'll find two of the park's most exclusive hangout spots. Unfortunately, I didn't go because both places are well out of my budget. But the view from onboard the ship is simply breathtaking. 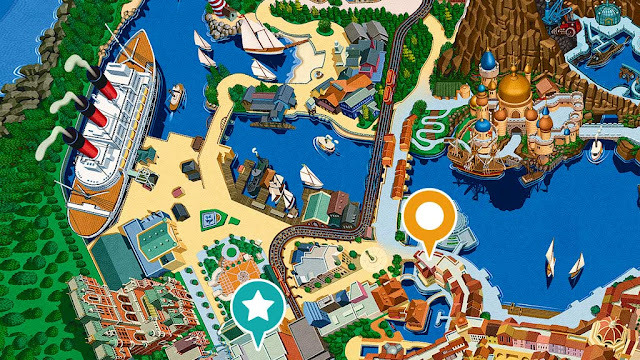 Don't forget to jump aboard the S. S. Columbia ship while at Tokyo DisneySea. While Tokyo DisneySea itself is already a magnificent theme park, it's these hidden charms that make it truly a world's best. There are so many things to discover and search in this park that one, two, or three visits would simply not cut it. Did you remember the first tips? Arrive (very) early, right? Well, same tips applies to the nighttime show Fantasmic!, which takes place at the main body of water right along the Mediterranean Harbor area. Taking place 90-120 minutes before the park's closing time, Fantasmic! is a copy of the show of same name at the other Disney parks in Anaheim, CA and Orlando, FL with its own unique twist. Fantasmic! brings a finish to the day with a spectacular bang! The best spot to watch Fantasmic! is either the Lido Isle to the left section of the Mediterranean Harbor or the plaza immediately following the entrance under Hotel MiraCosta. Both have their own pros and cons. I, personally, decided to watch the show from Lido Isle because of its proximity to the action (much closer). Guests watching from the plaza, however, are treated to magnificent backdrop of the volcano. Indeed, you have my 8 ultimate tips to make the most of your day at Tokyo DisneySea. But one thing that you should keep in mind is to never forget that you visit a theme park to simply have fun, not to schedule every single thing of your day. If that's the case, then where's the fun in the exploration and adventure then? Thus, my last ultimate tip is simply for you to have fun. Admittedly, you'll be rushed here and there, but that shouldn't stop you from taking a step back, relax, and simply have fun, right? Before you pass this gateway, promise yourself that you'll have fun. No matter what happens, no matter which path you decide to take, I hope you have an enjoyable and memorable visit to the world's best theme park.